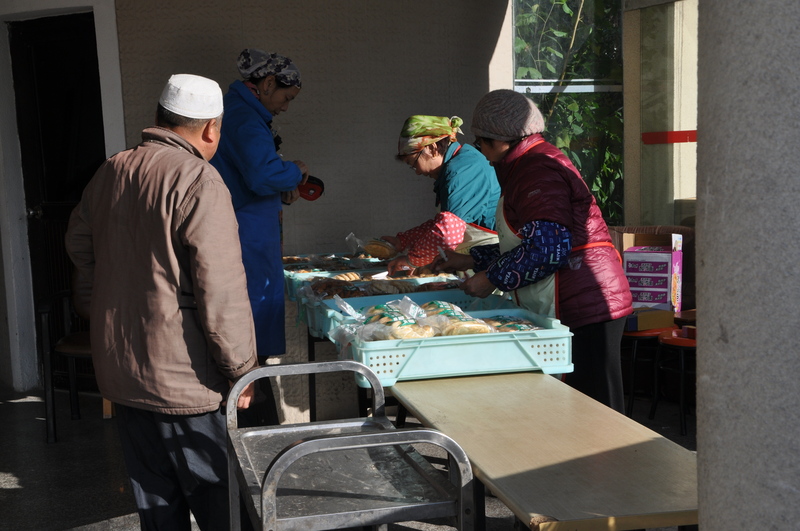 Our project began with a trip to the halal market outside the Pudong mosque on a chilly October morning. After chatting with some of the vendors and tasting some of the food, we were hooked, and all of work in Street Food and Urban Farming began to center around the halal market. For our second assignment we returned to the market and found a friendly couple selling 凉皮 and 肉夹馍. At first we were hesitant to approach them because they were very busy and focused on their work, but once we did not only were they extremely kind and welcoming towards us, but as it turns out, they actually supply our cafeteria halal station with bread and dumplings. In the interview they spoke about how much they enjoy coming to the halal market each week and how meaningful their work is to them; this inspired us to further explore what fosters the welcoming, lively atmosphere around the mosque and what factors led to the formation of the halal market. The Pudong Mosque, located at 375 Yuanshen Road, can trace its beginnings to 1935 when an imam named Hong Changjin and a group of Muslims living in Pudong rented a space near Dongchang Road to use as a prayer room. The mosque was moved to its current location in 1995 (Zhou). Every Friday, worshippers from all over Shanghai(mostly in Pudong) gather at the mosque to attend the afternoon prayer service. In response to this influx of Muslims each week, a halal market sprung up around the mosque to cater to hungry worshippers before and after the Friday prayer service. Because the prayer service only happens once a week, the market, which depends on the mosque’s attendees for patronage, is only there on Fridays from around nine o’clock in the morning to around five or six o’clock at night. The market is comprised largely of Muslim vendors who bring with them tents, ingredients, wares, and cooking implements to set up mobile stands from which to sell their goods. The items sold range from nuts and dried fruits to fresh meat, and from laboriously cooked stews (prepared on-site) to flash-fried dumplings. 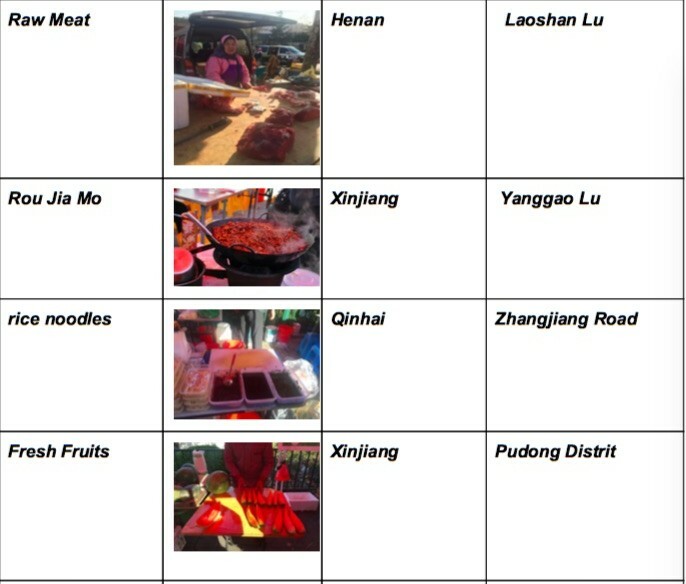 Though the vendors originally came to Shanghai from all over China, a majority of them are from Xinjiang. 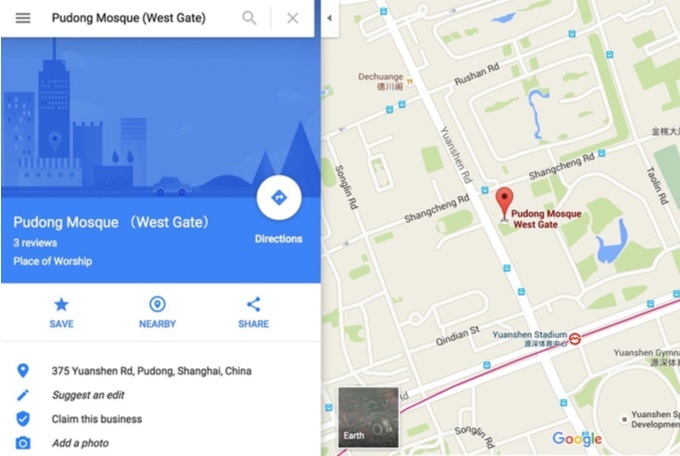 Within Shanghai, many live relatively close to the mosque in Pudong. Here is a link to an interactive map of the vendor locations. 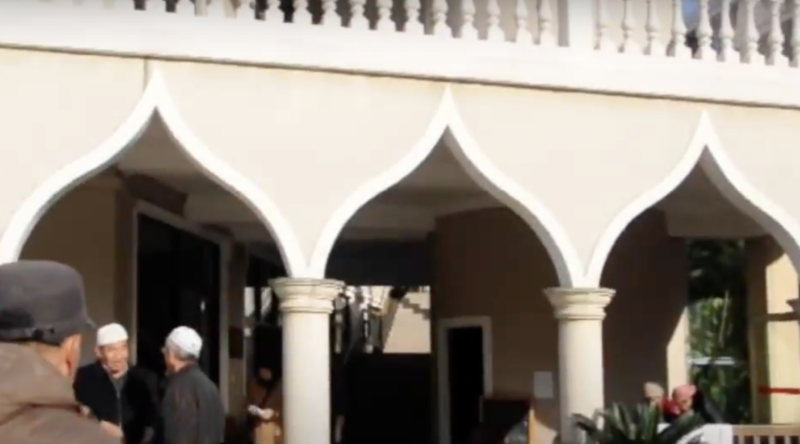 Though he requested not be be filmed, the current Imam offered some insights into the community of the mosque, noting that wherever there is a mosque, there is bound to be a market to serve to the worshippers. 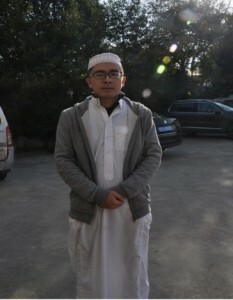 Hailing from Yunan, he has served as the Imam for two years now, and has found that the people who attend the mosque have created a kind and peaceful community. Though only 30 to 40 people typically come to pray on weekdays, anywhere from 800 to 900 people come on Fridays, thus providing an ample audience for the weekly halal market. Much like the vendors, the worshippers come to the mosque from all over Shanghai but are primarily based in the Pudong area. The vendors themselves echoed the Imam’s sentiments about the welcoming and enjoyable atmosphere of the mosque’s community. In particular, one couple from Xinjiang revealed that they own a successful catering and delivery business and choose to come to the market each week not from financial need, but rather because they find it a very enriching and pleasurable experience. Throughout this project, it has become clear to us that halal food and community are closely tied. 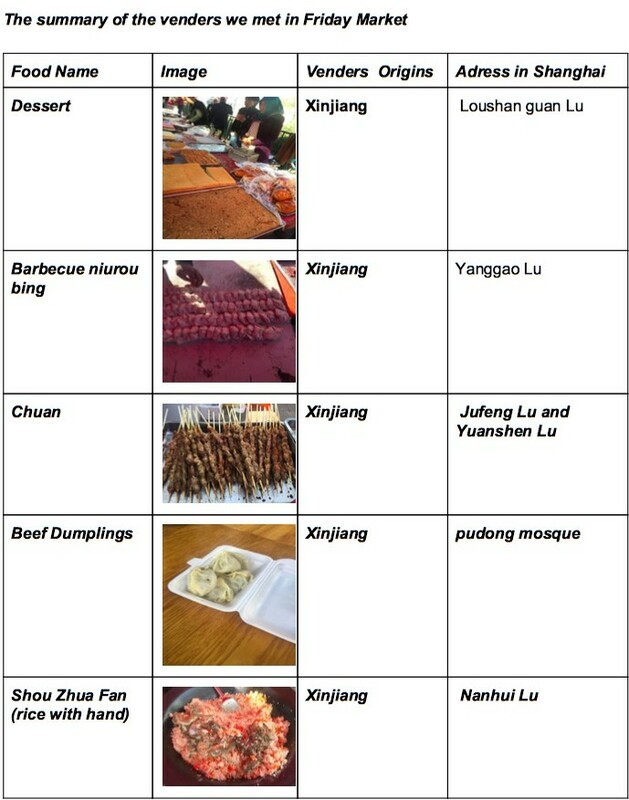 To get a better understanding of the experience of halal food in China from a Muslim perspective, we interviewed Ahmad Raja, a sophomore at NYU Shanghai, and Haider Ahmed, an NYU Shangahi freshman. Though they had differing opinions on the availability of halal food within Shanghai, both agreed that the Pudong Mosque promotes a sense of community. Despite the variety of the food, its differences by region, and the numerous places of origin of both halal food producers and consumers, one of the unifying factors we found in our research was that halal food in Shanghai fosters a community and a sense of ease. 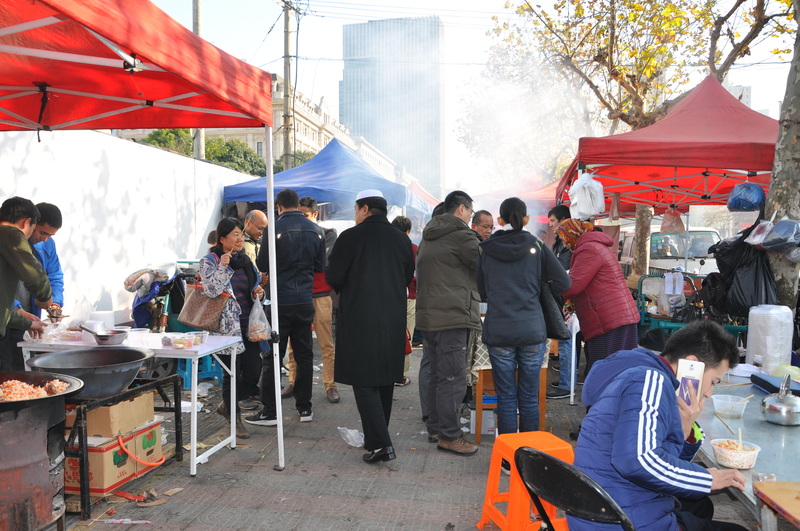 Due to the strict regulations on halal food, many Shanghainese (and indeed Chinese in general) are more inclined to trust the safety and quality of halal foods (Sile). This sense of trust in halal food combined with the growing Muslim population in Shanghai has led to a proliferation of halal establishments in the city. Amanda Zhao, a junior at NYU Shanghai and a Shanghai native, commented that, “It seems that halal food places in Shanghai are usually owned by a Muslim family. I feel halal food is a really important symbol/representative of the Muslim community in Shanghai because it’s the easiest way for common people to encounter Muslim culture”. As Ms. Zhao notes, halal food not only provides affordable, reliably safe meals, but extends to become a real cultural and interpersonal staple of the city. We saw this firsthand at the Pudong Mosque market. While the mosque itself serves to provide the framework of a community, the market serves to cement the ties of that community and to extend it beyond a religious context. The project Mapping Halal from Toronto University confirms that, “mosques act as magnets for halal food in their area and that as time passes, the amount of halal food locations increase. Some of the reasons for this could be that as a mosque is a community centre for Muslims, once established, attracts more people towards living nearby”, thus creating a community that is all-inclusive and accessible to Muslims and non-Muslims alike. Though our research only covers halal food in Shanghai specifically, our findings paired with insights from our interviewees and the research of Mapping Halal point to halal food at large being a community-building influence in the areas where it is present, especially when it appears in conjunction with a mosque. Though the core of the community it fosters may be Muslim, it also creates a welcoming communal environment for non-Muslims to experience Muslim culture and in doing so creates a community distinct from the community of the mosque. In this way, areas where halal food is sold encourage the formation of a diverse community that is unified in the name of delicious food and (though they may not realize it) cultural exchange. “Mappinghalal.” Mappinghalal. University of Toronto, n.d. Web. 10 Dec. 2015. <http://mappinghalal.wix.com/mappinghalal>. Sile, Aza Wee. “China Wants a Bite of the Booming Halal Market.” CNBC. NBCUniversal, 24 Aug. 2015. Web. 10 Dec. 2015. <http://www.cnbc.com/2015/08/24/china-wants-a-bite-of-the-booming-halal-food-market.html>. Zhou, Ruru. “Mosques in Shanghai.” ChinaHighlights. N.p., n.d. Web. 10 Dec. 2015. <http://www.chinahighlights.com/travelguide/muslim-china/shanghai-mosque.htm>.